The Ark in Space has been out on DVD for a long time. In the UK, it looks like it was the 9th title to be released in the range. As I mentioned in my review for The Aztecs, restoration technique and technology has moved on quite a bit since this title was originally released. When watching the stories in order, the quality of this story from the previous release stood out like a sore thumb mainly because it didn’t look as good as the other stories from Season 12 which were released later in the range. 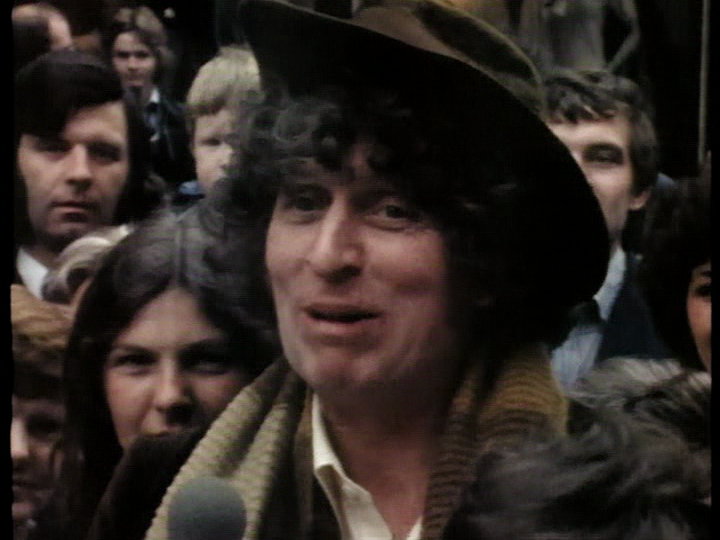 Now with a wonderful restoration, I am happy to revisit this loved story from Tom Baker’s inaugural season. I almost called it my favorite story from Season 12 but that would not be true. For me, it is almost impossible to have a favorite story from Season 12. I almost think it is one of the most perfectly balanced seasons of the entire series with one of the greatest groups of regulars the series ever had in its history. This is all my opinion but we get stories that feature the return of Sontarans, Daleks and Cybermen but their stories are all told a little differently. There is something a little more adult and horrific with them. Well, maybe not with Revenge of the Cybermen but I love it to bits anyway. Robot is (literally) a hanger on from the previous era (and production block) with a new Doctor and starting to come to the end of the UNIT era. Then there is this little gem called The Ark in Space. 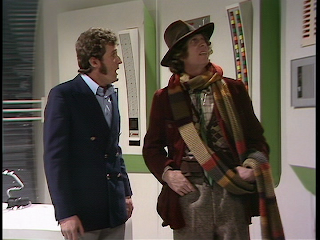 Thanks to Harry giving the Helmic Regulator in the TARDIS quite the twist, the Doctor, Sarah Jane and Harry land on a space station far, far off in the future called Nerva Beacon. Us, the viewer, is aware that there is already something on board but we are not sure what it is or its intentions. Right away, Harry and the Doctor get separated from Sarah Jane. 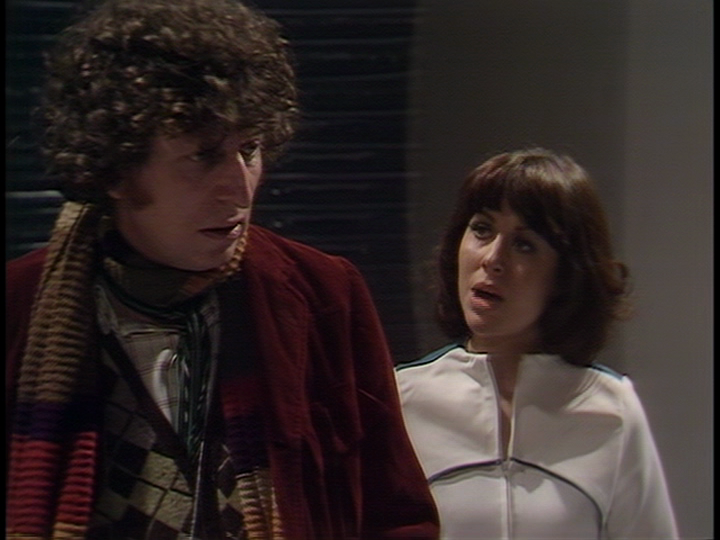 Sarah Jane ends up being transported to another part of the Nerva while the Doctor and Harry are battling the internal security system on the ship. It doesn’t take long for the Doctor to realize what this ship is. It is a massive ship that is carrying all of the Earth’s population and the entire body of information that makes up what is known about the planet. The Doctor and Harry enter this massive space that has rows and rows of people who are in suspended animation because of solar flares hitting the Earth. 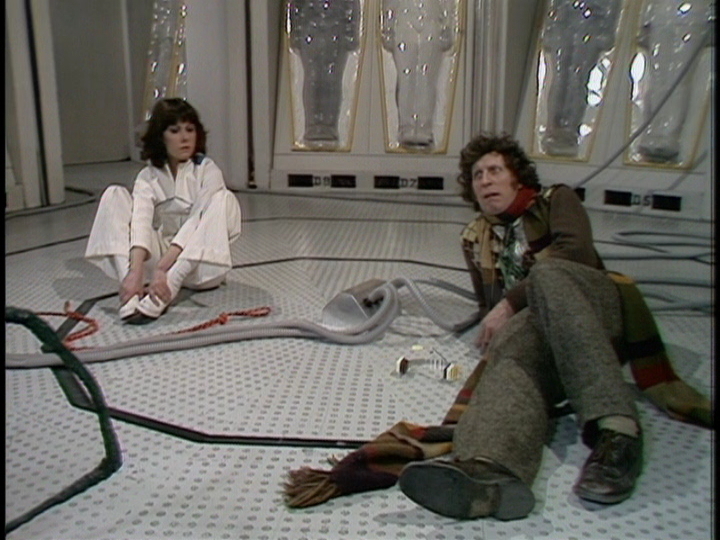 In one of the banks where people are “asleep”, the Doctor and Harry find Sarah Jane. When she was transported to another part of the ship, it took her as a new addition to the population and put her through the same suspended animated process everyone else went through thousand years earlier. While Harry is looking to find a resuscitator unit to revive Sarah, he opens up a closet door and a giant wasp like creature falls out at him. We will find out later that that is a Wirrn. 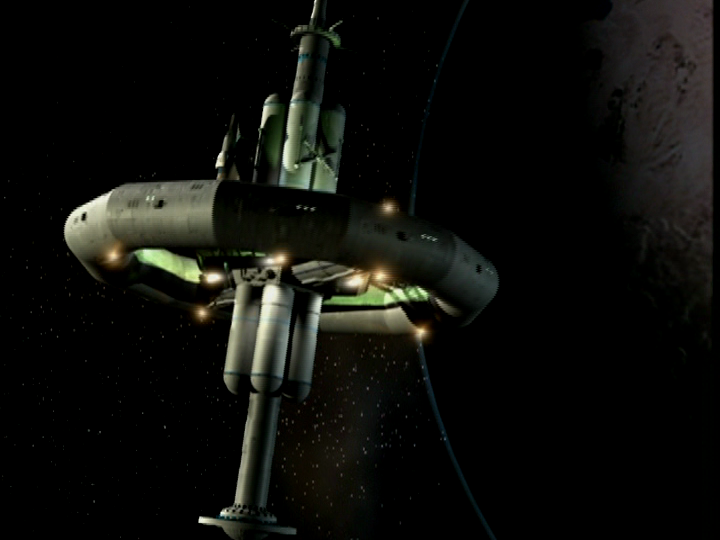 The Wirrn simply want to take over the space station Nerva and the Earth, but that is all. It’s not a tall order is it? When I first saw this story as a child, the more adult level of storytelling was lost on me a little bit. On PBS it is often the case where these stories are seen out of “Doctor Order”. So I may have seen most of the Davison stories before I got to this and the level of gruesomeness and adult violent themes may have been lost to me at the time but it certainly wasn’t when I watched this in perspective. Back in 2006 I had decided to go back and watch all of the episodes from Doctor Who from the very beginning in order with one 25 minute episode a day. Doing it this way is a wonderful eye opener. 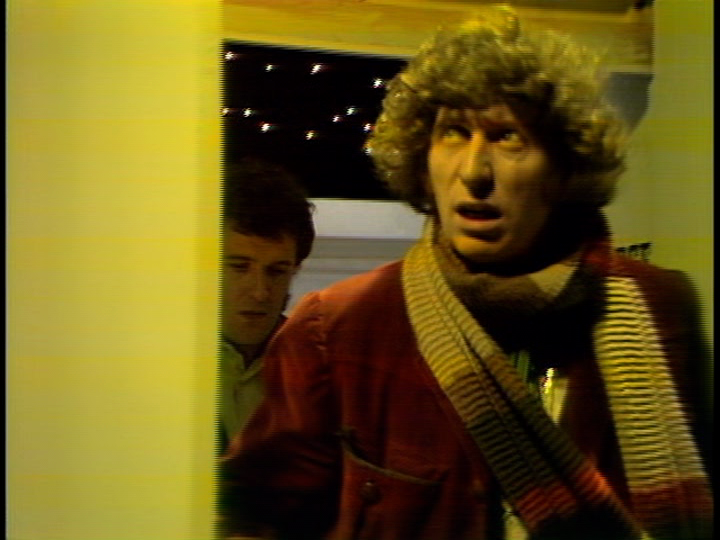 When I got to The Ark in Space it was a serious change in story telling from what we had seen in Doctor Who before. There no longer was a thin layer of child safety to it. I never thought of Doctor Who as a kid’s program but The Ark in Space becomes horrific. It’s the beginning of the Hinchcliffe/Holmes master plan. There has been few example prior to this of someone transforming into something else. 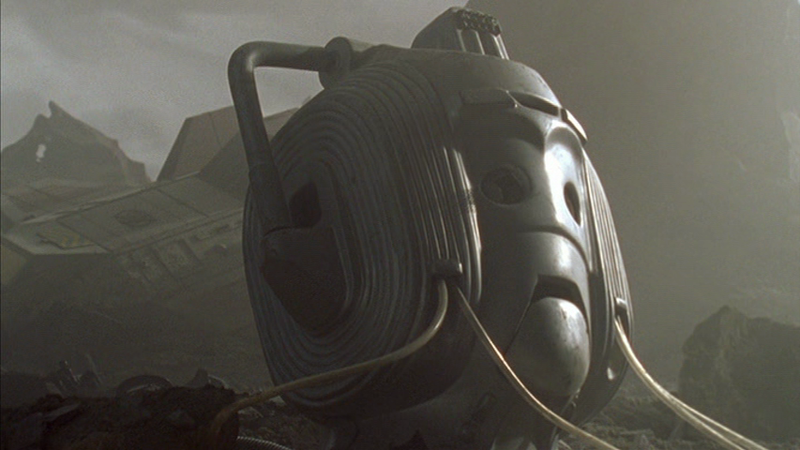 Mission to the Unknown with Garvey turning into a Varga plant and Toberman partially transformed into a Cyberman in The Tomb of the Cybermen. In The Ark in Space, the leader of Nerva Beacon is Noah. As he is checking the solar stacks for signs of sabotage he is brushed by the larvae Wirrn and his transformation begins. The transformation takes place over a couple of episodes and we see it in all of its gory detail. We see him in different stages of the transformation; the most horrific is seen on the cover of this release. There a few moments that reminds me a lot of some of the earlier Quatermass serials. For those who don’t know what the reference is, Quatermass was a set of serials on the BBC in the 1950s written by Nigel Kneale. To many, these are the blueprints to British Science Fiction television and a lot of concepts seen in those 3 serials show up in many different places. Another Quatermass production was done by Thames television in 1979. In The Ark in Space, the Doctor takes the outer layer of the eye of the dead Wirrn found by Harry and hooks himself up to it. The memory of that particular Wirrn’s last minutes alive are seen via the Doctor on the monitor. It is very familiar to when Barbara Judd was hooked up to a device in Quatermass and the Pit that showed the Martians weeding out unwanted mutations as we see it from their perspective. Near the end of the story, we see the Wirrn in force outside the space station advancing on the rocket Harry, Vira and Rogin have taken refuge in. It is so un-human and actually grotesque in some ways. It’s like an infestation! That reminds me of when Quatermass sees the aliens jumping around in their dome in an episode of Quatermass II. 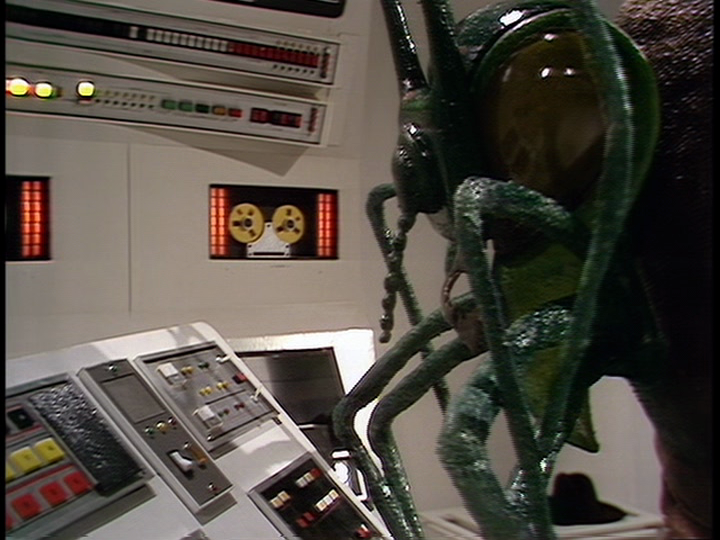 Finally, more tangential, there is a scene where the Wirrn grub advances on the control room with Harry and the other crew firing on it. 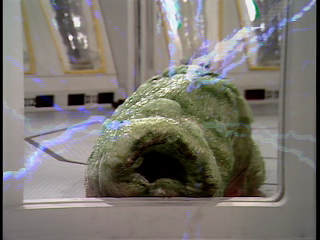 There is a shot of the green membrane stripping away from itself immediately reminds me of when we get into the capsule of the film version of Quatermass and the Pit and see the Martians in the cockpit for the very first time. Doctor Who has been blessed with many talented designers over the course of its long history. Possibly one of the best is Roger Murray-Leach. The rising catacombs of the human race are inspired. It gives a tremendous feeling of height and the way the set is designed makes it look like that it’s just one room out of many with bodies that rise up. The room with the solar stack is tremendously atmospheric. The set is raised up from the floor which gives a nice metal gantry sound when humans walk on it. It’s nice to see a dark set with a great deal of shadows. Where there is light such as coming from the stack itself, it has a piercing glow that gives the room eerie feel. Then of course there are those corridors that also get a re-use in Revenge of the Cybermen. I love those corridors! I think this is one of Dudley Simpson’s best and most memorable scores. It adds to the creepiness of the story and the cues are placed in appropriate places to get the most out of the moment. The guest cast is great. My favorite is Wendy Williams who plays Vira. She starts out so stern and slowly over the course of the 3 episodes she is in softens and becomes extremely likeable. Kenton Moore as Noah has a lot to do as he transform into a horrible creature. He has an internal struggle between trying to stay human and the Wirrn taking him over permanently. Who wins? You even get the voice of Peter “Orac” Tuddenham in it! As I mentioned above, the Season 12 lineup of the Doctor, Sarah Jane and Harry is one of my favorites in the entire history of the series. 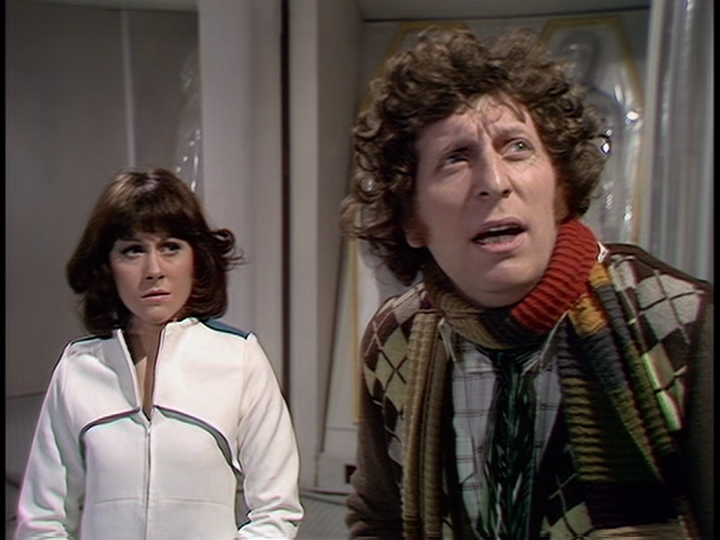 Elisabeth Sladen always adds something to the character of Sarah that is not the script. For example, her determination to get out of the tiny utility corridor as she gets stuck and the Doctor bates her to get out is a favorite moment of mine. What I love about Ian Marter’s Harry Sullivan was that he was a naïve gentleman. He treated women as he thought they should be treated but was terribly old-fashioned which would annoy Sarah. He really annoyed her when he would call her “old girl”. 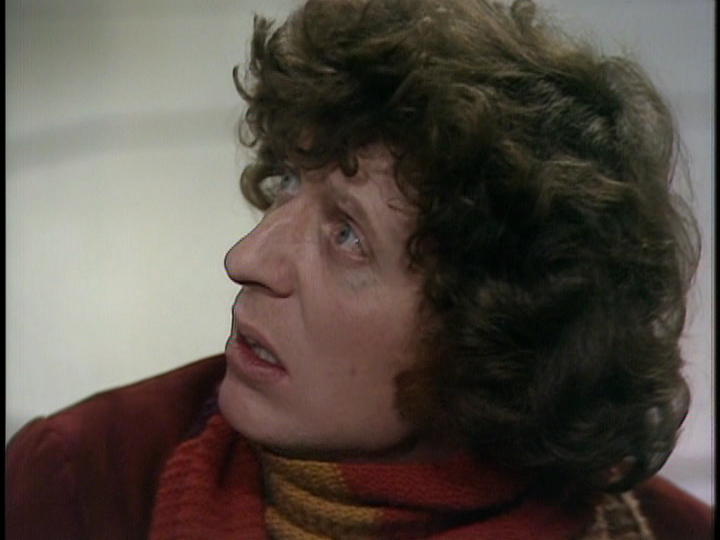 Tom Baker is quite early here in his tenure as the Doctor. I love the way he plays the role in this story. It reminds me of an interview I saw with Philip Hinchcliffe I saw from many years ago. He mentioned how well Tom delivers the “Homo Sapien” speech in Part One. He says that Pertwee couldn’t deliver that speech like that. He’s right. He didn’t mean it as a slight to Jon but saying how different of an actor Tom was to him and this was more in his style. It was the first time I really understood what acting was. As stated at the beginning of this review, this is a 2-disc Special Edition release. Some of the extras are from the original 2002 release and some are new. Audio Commentary: From the original release. Tom Baker, Elisabeth Sladen and Philip Hinchcliffe. This is a nice commentary with some good insight from Lis and Philip. Less so from Tom but he jokingly says at the beginning that he doesn’t remember anything from it! There are a lot of pauses as I think they got caught up in the action of the program. It is a nice reminder on how important it is to have some kind of moderator. Of course, anything with Lis is nice to hear. It is still quite simply perplexing to me that she is gone. 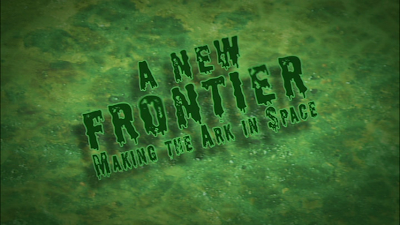 A New Frontier: This is a brand new feature that goes into great detail about the making of this story. There was a hole in the lineup of stories when Philip took over. The original story Space Station from Christopher Langley was unusable and so was John Lucarotti’s attempt. This feature goes into great detail as to why these were unusable. 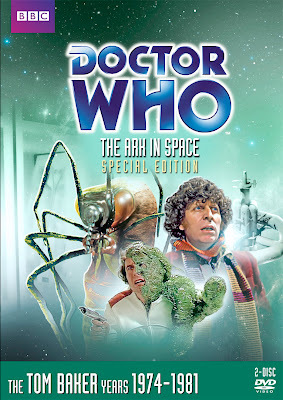 It has some great snippets from Philip Hinchcliffe, Roger Murray-Leach, Kenton Moore and Wendy Williams. The feature does what it’s supposed to do which is give us an organized insight into the making of the story. Where I feel these features sometimes fall flat is how these programs are graphically treated. For ongoing series like Doctor Forever! the graphics created for it are brilliant. For this, it doesn’t seem right. To me it looks like it is going for a “The Blob” like B-movie look. The green membrane from the story is the graphic focal point to this feature but it is treated more like slime from You Can’t Do That On Television rather than being membrane from the Wirrn. The fonts used are virtually unreadable. I always applaud the creativity in these features in how they pay homage to the stories they represent but sometimes don’t always work for me. Roger Murray-Leach Interview: From the original release. This was done back in 2002 and gives a lot of great information about designing the sets for this story. This information also is re-told in A New Frontier (which it should!) but there is a little more detail here. Where it becomes rushed is when he starts talking about other stories he worked on. It all moves quickly but luckily since this had been made he has been on other DVD extras speaking about those other stories in more detail. Original BBC Trailer, Alternative Title Sequence, 16mm model footage: From original release. These are great archival pieces that are what makes the Doctor Who releases stand out from all other television series released on DVD. These are wonderful. CGI Effects Footage & 3D Technical Schematics: From the original release. This was the first release where you could view new CGI effect shots in the story replacing the original effects if you so desire. This CGI still holds up well but I personally don’t want to view these episodes with new effect shots but I understand why others do. The 3D Schematics is a bit of fun as we can see where all of the the places we visited in the story are located on Nerva. 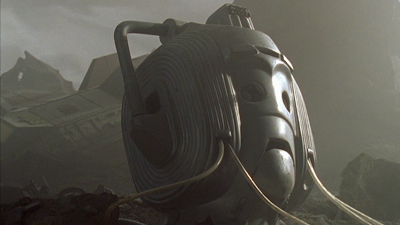 TARDIS Cam: Originally for the official Doctor Who website, this is my favorite of all of the TARDIS Cams as we see a broken Cyber helmet in the foreground as the camera pans to the TARDIS. After all of this time, it still stands up very well. Photo Gallery: Brand new and in the current style of the Photo Galleries we currently get on the releases. The images are great and presented much better here than in the first release. Production Notes: This is a new set of notes. A lot of great info here but my favorite is listing what other productions were being shot at BBC Television Centre on the day that each episode of The Ark in Space was being recorded. Doctor Forever! Love and War: This edition of Doctor Forever! focuses on the New Adventures and Past Doctor Adventures that were around in the 1990s. For many this was the only way to get new Doctor Who. These novels were not only the vital link between the classic series and the new series, the new series got some great ideas form this range of books and even nabbed a few of the writers. That being said, I was never a big fan of the books yet I found this feature fascinating. It held my attention and I learned a few things especially how the rights to the series of books transferred from Virgin to the BBC. The Ark in Space Omnibus version: This is the “movie” version that was shown on BBC1 as a repeat back in 1975. It comes in at 70 minutes. In the past we got the omnibus version to Planet of the Spiders on DVD. I love that these are included. It feels like us Yanks get a chance to tap into a bit of UK nostalgia. I loved watching this. To my eyes this wasn’t restored but it still looks great and I am thankful this is included. Scene Around Six: If anyone ever wondered if Tom Baker was ever really that popular as the Doctor, just watch this. This is news footage from 1978 of Tom visiting with children in Northern Ireland. It is really neat and dear footage as these little kids got a chance to meet their hero. Tom is in fine form here and it is a sweet piece that reminds us how special this series is to everyone. 8mm Location Footage to Robot: Just when you think everything is found and accounted for in terms of rare footage there is this brief but really cool 8mm footage of shooting a scene from Part Four of Robot. It is historically important and all too brief. It is awesome that it exists and present on this disc. What’s missing from this release? This DVD set replaces one that was released back in 2002. Back then, the DVD sets were authored separately from the UK sets. Early on the US DVDs featured content that was not on the UK DVDs. Now that DVDs are manufactured for both UK & US at the same time with the same content, the result is some stuff from the original US DVD release is not included in this Special Edition. Who’s Who: This was a simple but enjoyable feature that Steve Manfred put together on the DVD releases that gave us information on all the actors in the story. It was laid out nicely and although now off the Special Edition, this information is easy to find on such sites as IMDB. Howard Da Silva Openings and Closings for The Ark in Space: When the series was first syndicated by Time Life in the late 1970s. He did a narration for the opening and close of each episode to let us know what is going on in the episode. This was done for many of the Tom Baker episodes. This would have been a fun thing to have on the UK releases as a way for the UK fans to enjoy a bit of US nostalgia. For whichever reason, they were never included on the UK discs. Back in the 1990s PBS producer TJ Lubinsky made it his mission to restore the Howard Da Silva Intros & Outros by tracking down broadcast quality masters of the Da Silva episodes he did not have in his library. I know this because in 1998 I lent him my broadcast master for The Ark in Space Part One that has the Howard Da Silva Intro/Outro. That was used on the original disc. It’s a nice piece of nostalgia. Too bad it’s no longer available on the new set. The news report from Wookey Hole from the filming of Revenge of the Cybermen is not on this new Special Edition DVD. Of course that is because it is now on the Revenge of the Cybermen DVD. When this story was originally released the Restoration Team did not use the Transform PAL Decoder on these episodes because it did not exist. The first release this restoration tool was used on was the original Resurrection of the Daleks. The Transform PAL Decoder brings out more detail and lessens artifacts. I am sure there is a lot more that is done to this story that helps make it look so good but I do not know what it is; all I know is that it looks great. I think there is a noticeable jump in picture quality between the two releases. Also, the opening and closing credits for all the episodes have been replaced. This is another cover by Lee Binding. It is a huge improvement over the original R1 DVD cover but I still prefer the original R2 DVD cover the best. That was really simple and just featured a Wirrn. 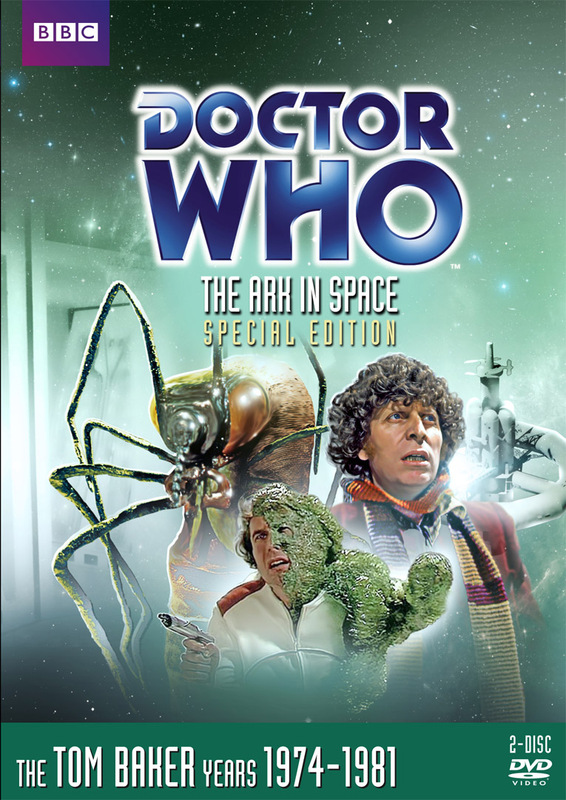 Disc 2: The Ark in Space Omnibus Version, Doctor Forever! 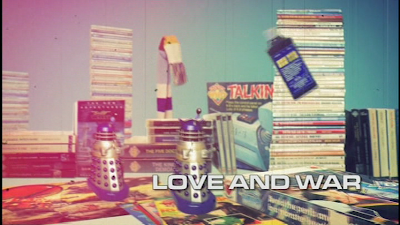 : Love and War, Scene Around Six, 8mm Robot Footage, PDF Materials. I am really loving these Special Editions. I love the quality upgrade and the deep digging in the archives to come up with some cool things. The new features aren’t that bad either. I certainly think this is a worthy upgrade and now really fits in nicely, picture-wise, with the rest of Season 12. Next review: Working my way through the massive 22 disc box set of Acorn Media’s Foyle’s War. It’s a fantastic way to spend some time. I will also have reviews up later in the month for the Penelope Keith comedy series No Job for a Lady complete series and Midsomer Murders: Tom Barnaby’s Last Cases both released by Acorn Media. Yeah, No Job for a Lady comes out here on 3/19. I had Series 1 on PAL DVD but this will allow me to watch the rest of the series (plus re-watch the first)! I have not watched this series yet. Hope next time I will keep it in my movie reservation on DVD and enjoy it. For this I have to Convert Video Tape to DVD.